History is not a simple meritocracy: it is a narrative of the past written and revised — or not written at all — by people with agendas. Forgetting women architects has also been imbedded in the very models we use for writing architectural history. The monograph format, which has long dominated the field, lends itself to the celebration of the heroic “genius,” typically a male figure defined by qualities such as boldness, independence, toughness and vigor — all of which have been coded in Western culture as masculine traits. Moreover, the monograph is usually conceived as a sort of genealogy, which places the architect in a lineage of “great men,” laying out both the “masters” from whom he has descended and the impressive followers in his wake. For those seeking to write other kinds of narratives, the monograph has felt like an intellectual straitjacket, especially in contemplating the lives and careers of women who do not fit the prescribed contours. Stratigakos's essay serves as a digital call to arms, to get more women into Wikipedia and other online encyclopedias so that (at minimum) their existance cannot be called into question. But digital means are not the only ways of unforgetting, and when I finally picked up the neon orange A Handbook of California Design, 1930-1965: Craftspeople, Designers, Manufacturers, published this spring as a companion and follow-on to the 2012 exhibition at the Los Angeles County Museum of Art, "Living In A Modern Way," it seemed like another means of unforgetting, one which takes on the monograph form by suggesting that a group biography, emphasizing connections, collaborations and a sort of collective design advancement, might do just as well. The book, edited by curator Bobbye Tigerman and designed with her usual aggressive simplicity by Irma Boom, includes 140 one-page biographies of what Tigerman calls "significant figures from the period 1930 to 1965 and the full range of design disciplines." Each entry is illustrated, usually with a period portrait, and each includes a short bibliography of sources. Each could, and in most cases should, be a jumping off point for a longer work, whether a Wikipedia entry, an essay, or an old-fashioned monograph. Those modest, helpful notes are a rebuke to so many contemporary design books that think they can do without a bibliography. Even better would be an online database of these articles (even if it had to be protected in some way), sharing the PDF wealth and making the first research step that much easier. If architecture history has been slow to recognize other types of careers in book form, design has been slower still. The textile designers represented here alone deserve so much more study, from the new fibers in bathing suits, to "first lady of the loom" Dorothy Liebes, to Lanette Scheeline's pictorial screenprints. Many of the designers and craftspeople mentioned in the Handbook were familiar to me through commerce rather than study. Everyone knows, and hence knows the price of, work by the Eameses. 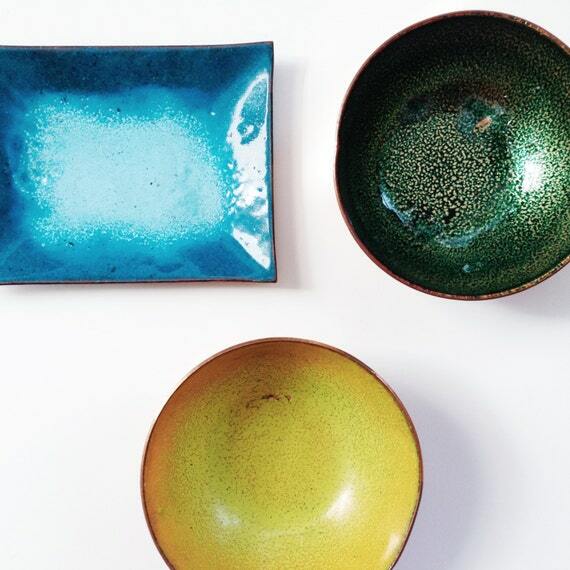 But Kenji Fujita, La Gardo Tackett and Architectural Pottery, Jade Snow Wong, were only known to me because I follow the hashtag #thriftbreak on Twitter. I've written about this virtual community before, as I am continuously impressed by their ability to pick museum-quality modernism out of the HomeGoods detritus of Goodwills, Savers, and tag sales. They know about these lesser-known talents because pieces and sets are still out there for the picking, particularly on the West Coast. While many on #thriftbreak will surely want to buy this book, they may be graitified to hear that most of the listed artists are illustrated by portraits. Finding all of those portraits is an accomplishment -- Tigerman offers special thanks to the photo research of Staci Steinberger in her acknolwedgements -- but it would have been nice to have images of the products alongside some of the portraits. After a while I began Googling each person whose biography interested me, to see whether what they made was as intriguing. I also occasionally questioned the book's broad definition of California-ness. Herbert Matter, for example, is hardly a forgotten designer (the bibliography mentions both a documentary and a monograph), and spent only three years in California, from 1943 to 1946, working for the Eames Office. I understand his usefulness here as a collaborator on the graphic and photographic presentation of the Eameses' work, as well as design for Arts and Architecture magazine, but did California change his career? Did he change its design? It seems more like an interlude before he took his angles and abstraction back to New York in the service of Knoll, Inc. More productive is seeing figures like industrial designer Henry Dreyfuss, whom I've always identified with New York, in a West Coast setting. Dreyfuss set up an office in Pasadena in 1944, and was officially a California resident after 1945. Many of the Dreyfuss office's most important clients, including John Deere, Polaroid and Lockheed were served by partners based in Pasadena. The geographic displacement made me think about more local connections, like that of car design, Pasadena, and Art Center. Dreyfuss employee Strother MacMinn, who gets his own entry, began teaching at Art Center in the 1940s. "At the time of MacMinn's death, his eulogist estimated that one-third of all important American automotive designers had trained with him," Steinberger writes. Another unexpected inclusion is that of fashion designers and manufacturers. I didn't get to see "Living In A Modern Way" when it was up at LACMA, so I can't judge how companies like Cole of California, Catalina Sportswear were integrated into the overall exhibition narrative. I can see the visual link between the bikini, as shown above, like Architectural Pottery's outdoor planter, as an embodiment of the lifestyle sandwiched between the sliding glass door and tiled pool of the mid-century Californian architect. 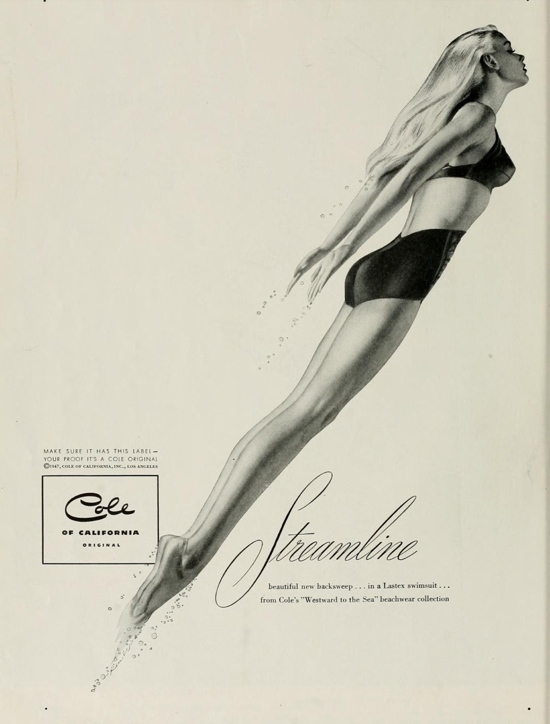 The advertisement above, reprinted in the book, also makes a connection between the revolutionary new textiles and the streamlined products abundant on store shelves in the 1940s. 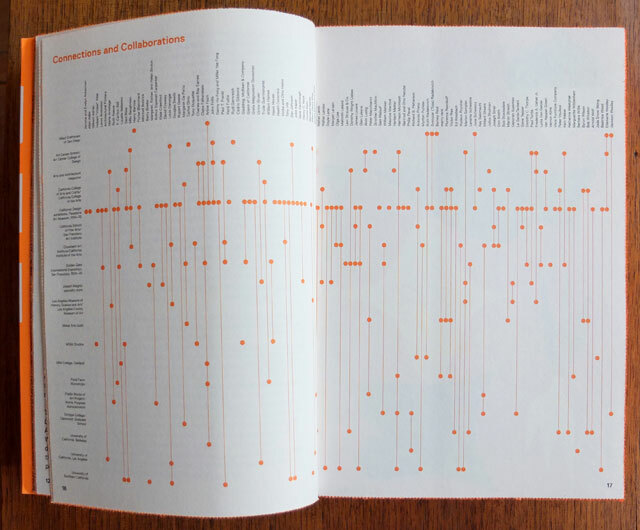 Maybe I'm talking myself into it, but it seems telling that these fashion companies are not shown on the (almost illegible) chart of "Connections and Collaborators" at the front of the book. They seem to exist in their own, separate-but-connected world. But these are small points. Overall, the Handbook is a must-buy for those interested in mid-century design, and a model of the kind of scholarship and publishing that leads to less forgetting, and more knowledge, of the accomplishments of all kinds of designers. Thank you for calling attention to the active writing (and writing out) of the history of design! A new book, about California Design gets reviewed as a kind of feminist history, and all of the women designers (and a few minorities!) get picked out to fit the authors agenda. If you want to show pretty pictures, there's no reason you need to wrap them in an overwrought thesis about women and wikipedia, seeing how many female designers we can mention without really exploring any of their work. Reminds me of how unfair and exploitative the media has become to designers, using them to fill some agenda without any real examination of the work. Why can't we celebrate good design first, without grouping it, classifying it, branding it for this Oprah Magazine female back patting. My response is probably somewhat flagrant self-promotion, but I wanted to applaud the recognition of this fine and important catalog of California designers, craftspeople, and manufacturers and to offer a few observations about the nature of "unforgetting" and its modes. I have a book coming out next year — Earthquakes, Mudslides, Fires & Riots: California and Graphic Design 1936-1986 (Metropolis/Artbooks D.A.P.). Hopefully it addresses some of the shortcomings in coverage of California graphic design that was mentioned — although that’s not necessarily the intention. The book was conceived out of work (as exhibition designer) on a number of shows about California art and artifacts, including LACMA's millennial extravaganza, "Made in California." (1999-2000). These experiences sharpened my awareness that California art came about because these artists defined what art could be for themselves, rejecting New York and Europe as the standard-setters. It wasn’t much of a leap to imagine that for some California graphic designers this epiphany must have arrived as well, even if it wasn’t quite the same lighting bolt. So for the last 10 years or so I've been observing California graphic design to see what might characterize this distinction. The idea of adding to the body of historical literature in a responsible and meaningful way was daunting. I’m not a scholar, theorist, or critic even though I’ve awkwardly dabbled. But then I came across Reyner Banham's introduction to Los Angeles: The Architecture of Four Ecologies, and along with numerous conversations with Lorraine Wild, my own “California” epiphany arrived: Finding a means of telling this tale in a mode other than what Banham refers to as “old types of historical bottles.” Biographies, monographs, articles, criticism, historical surveys, etc., all contribute to the “unforgetting” and are important, crucial, and time-tested models for building and sharing knowledge, but what knowledge lays dormant because these models don’t accommodate certain stories? Where the wine of new connections and revelations can’t be savored because the offered forms and modes fall short? Perhaps what’s needed is a “California” approach to reflect and refract many dimensions. One additional note: My book has 4 major sections (I call them “books” to distinguish that there are other stories to be told and that each is a very distinct framework). There’s “Sun-baked Modernism” (what happens to modernism in California graphic design); “Industry & the Indies (graphics done for all sorts of screens); “Sixties alt Sixites” (there was much more than just psychedelic posters); AND “California Girls” — who had more of an indelible and global influence on design and culture than anywhere and therefore deserve an unforgetting all their own. Finally, I want to acknowledge the debt that I owe to the Handbook and the crackerjack, meticulous job that Staci Steinberger, Bobbye Tigerman, Jennifer Munro Miller, and Lacy Simkowitz did. It set the factual record straight on many details from which I was able to confidently move forward. 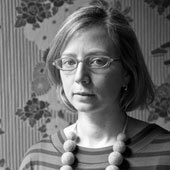 Alexandra Lange is an architecture and design critic, and author of Writing about Architecture: Mastering the Language of Buildings and Cities. (Princeton Architectural Press, 2012). Her work has appeared in The Architect’s Newspaper, Architectural Record, Dwell, Metropolis, Print, New York Magazine and The New York Times. What the best sports commentary does is just like criticism: it makes you care about the previously abstract. An appreciation of Lucia Eames (1930-2014). A photographic tour of Mexico City, house by house, wall by wall. The Folk Art Museum, David Adjaye's market hall, and the first addition to the Morgan Library. If three makes a trend, then premature demolition qualifies. Why you have to love design to be a critic.